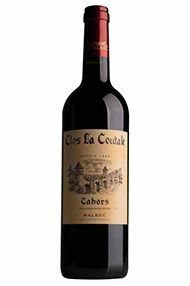 Older than Bordeaux and with a reputation for saturated colour, richness of fruit and muscularity, Cahors is the only French red wine to harness the power of the Malbec grape. Cahors is located in the south west corner of France, in the Lot department, with Bergerac to the north west and Gaillac to the south. It is one of the oldest wine regions in the country, however, as its vineyards were completely destroyed by frost in 1956, it took several years and considerable investment in the late 1990s for the region to re-establish itself on the quality wine map. The Cahors AOC is also one of the largest appellations in the Southwest, with over 4,200 hectares in production. The Malbec grape, locally known as Auxerrois or Cot, is grown with excellent results and is the main variety of the blends with a maximum of 30% Merlot for softness or Tannat for more structure. Unlike other important south west French appellations, and quite remarkably so, neither Cabernet Sauvignon nor Cabernet Franc is allowed in the appellation. The wines are deep in colour and the best examples can last for up to 9 years, although many are now made in a more contemporary, approachable style so that they can be enjoyed young. They display concentrated blackberry fruit, violets and licorice flavours and robust yet finely-integrated tannins.